It's almost Super Bowl Sunday! Woohoo? Okay let's be honest. I'm not super into the Super Bowl (see what I did there?). Don't get me wrong, I love football. But I prefer college football over professional football. You probably don't care about that, though. So let's move on. I may not be the biggest fan of the Super Bowl, but I am into get-togethers and parties, of any kind. Especially when food is involved. And the half-time show is pretty entertaining. I think Queen B (Beyonce) is performing this year. So I'll likely be dancing, AND DANCING WELL, in the background somewhere during that time. The rest of the time, you can find me around the snack table. 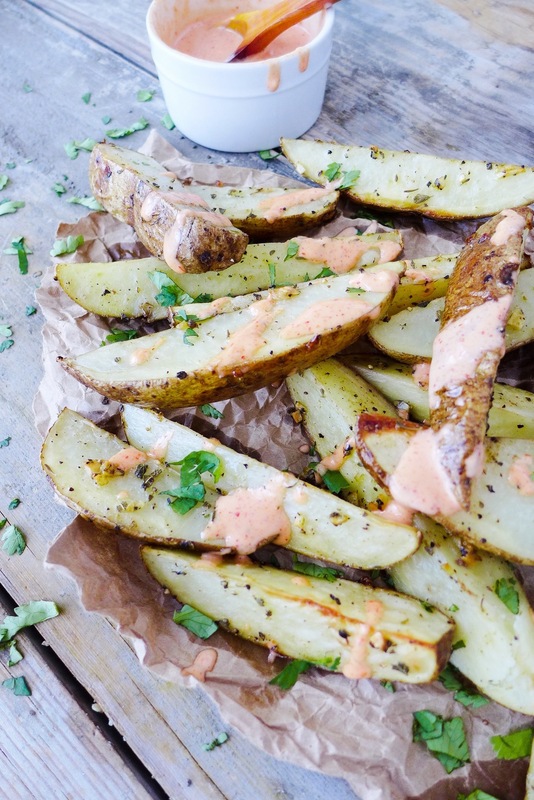 Which brings us to todays topic finally... Garlic & Herb Potato Wedges with the easiest, most delicious, scrumptious, 2-Ingredients Chipotle Dipping Sauce. These potato wedges are a great addition to the party-food table. It's an easy-to-make finger food that is generally loved across the board. Plus you'll be serving them with an addicting chipotle sauce, which by the way, is simply Sriracha and vegan mayo mixed together. But nobody needs to know that, am I right? I think I've rambled enough for you today, so just know that these potato wedges are really great for snacking and are a healthy option to pair with your burgers. What are you guys doing for the Super Bowl? What's your go to party dish? I would love to know and get some ideas! Let me know in the comments below! 1. Preheat oven to 375 degrees F. Line and oil a baking sheet. Set aside. 2. Add the wedges to a large bowl. Pour in olive oil and toss to coat. 3. In a small container, stir to mix the seasoning ingredients. Toss the wedges with the seasoning mixture. Sprinkle with cilantro.4. Lay the wedges flat on the baking sheet, skin side down. Bake for 25-30 minutes until golden brown. 2-INGREDIENT CHIPOTLE DIPPING SAUCE1. Mix the Sriracha and mayo together until well combined.